I was surprised that they use the term “spreading”, since the article fails to mention any of the recent research pertaining to the spread of obesity through social networks. You can use the tools at the CDC website to determine your own BMI. For 2005 — 2006, obesity prevalence was 33.3% in men and 35.3% for women. However, the prevalence of obesity doesn’t present a complete picture of weight trends among U.S. adults. By comparing the distribution of body mass index in 1976 — 1980 and 2005 — 2006 for adults 20 — 74 years of age, the data indicates that the entire adult population is heavier. Those adults heaviest have become heavier since 1980. Non-Hispanic black and Mexican-American women were more likely to be obese than white women. Among men, the prevalence of obesity did not differ significantly by race or ethnic group. To see how obesity rates have increased over the past 20 years, check out the CDC’s animated map of U.S. obesity trends. In view of these alarmingly high rates of obesity in all population groups, CDC has made the prevention of obesity one of its top public health priorities. Indeed, since the publication of The Surgeon General’s Call to Action to Prevent and Decrease Overweight and Obesity in 2001, the CDC has taken the lead on many of the Department of Health and Human Services initiatives and programs . The programs include communication and education efforts; interventions in nutrition, physical activity, and fitness; disease surveillance; research; clinical preventive services and therapeutics; and policy and Web-based tools. They target populations at all life stages, including infants, breastfeeding mothers, and children and adolescents. Individual behaviors, environmental factors and genetics all have an effect in causing people to become obese. The choices individuals make with respect to the foods they eat and their physical activity can also contribute to obesity. The CDC offers a number of nutrition resources to help people start healthier eating habits. I’ve written previously about the so-called obesity epidemic in children and the results of a number of studies identifying a connection between food consumption patterns and television advertising. To my knowledge, no study to date has evaluated the effect of television advertising and food consumption on adults. Ogden et al. Obesity among adults in the United States–no change since 2003-2004. NCHS data brief no 1. Hyattsville, MD: National Center for Health Statistics. 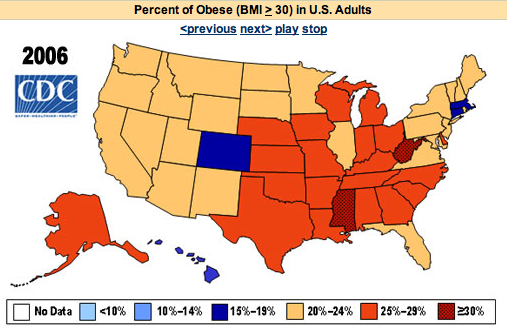 2007 Nov.
New CDC Study Finds No Increase in Obesity Among Adults; But Levels Still High. National Center for Health Statistics News Release. 2007 Nov 28. Gerberding and Marks. Making America fit and trim–steps big and small. Am J Public Health. 2004 Sep;94(9):1478-9. Overweight and Obesity. Department of Health and Human Services Centers for Disease Control and Prevention. Page updated on Nov. 17, 2007.